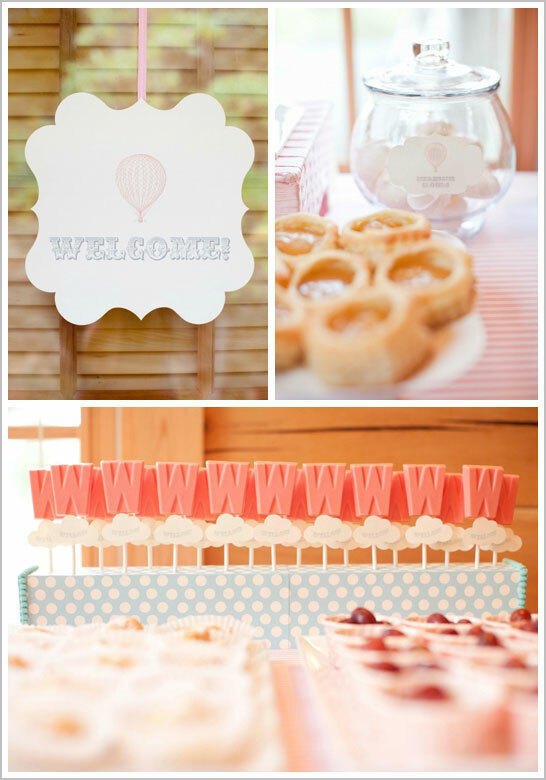 Hold on to your hats because today’s adorable baby shower is sure to blow you away! Up, Up and Away, that is! When I first received a note from Jessica Harris about this event… I knew it would be good! We’ve had the pleasure to ooh and awe over Jessica’s cakes in the past (see them here). She is an incredible cake designer who also happens to be part of a family of artistic women! So what happens when a talented graphic designer (Kim Harris), cake designer (Jessica Harris) and photographer (Jamie Zanotti) come together to welcome a new baby girl into the family? 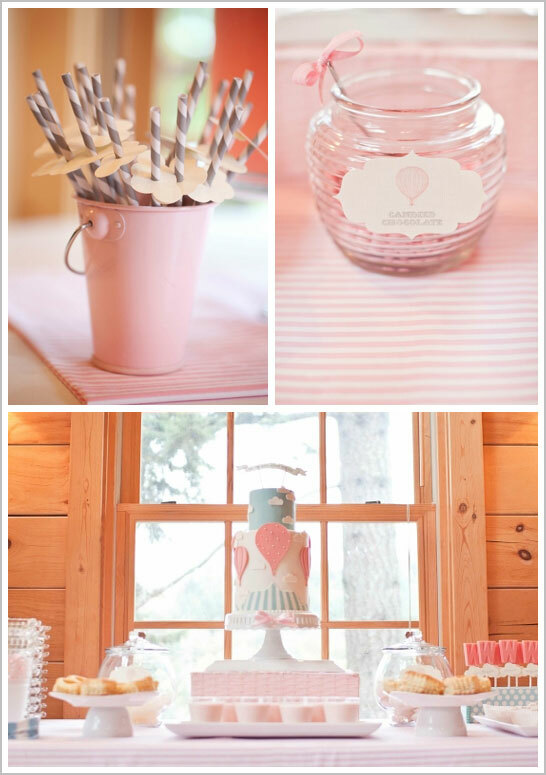 An amazingly sweet and thoughtful event full of charming DIY touches. 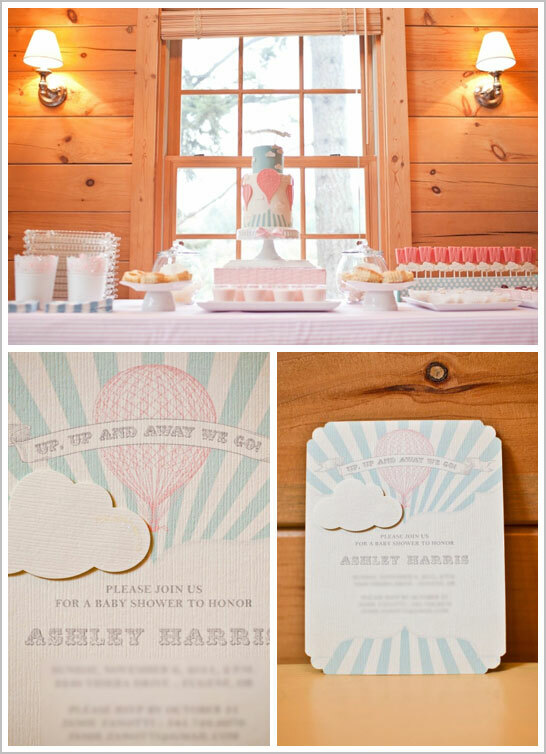 Based on the baby’s hot air balloon nursery, prepare to be swept away by this Up, Up and Away Baby Shower! Kim Harris, creator of the invitation and graphics, was kind enough to share some of her thoughts with us about this adorable shower. Okay, can we pause for a second and talk about this cake? 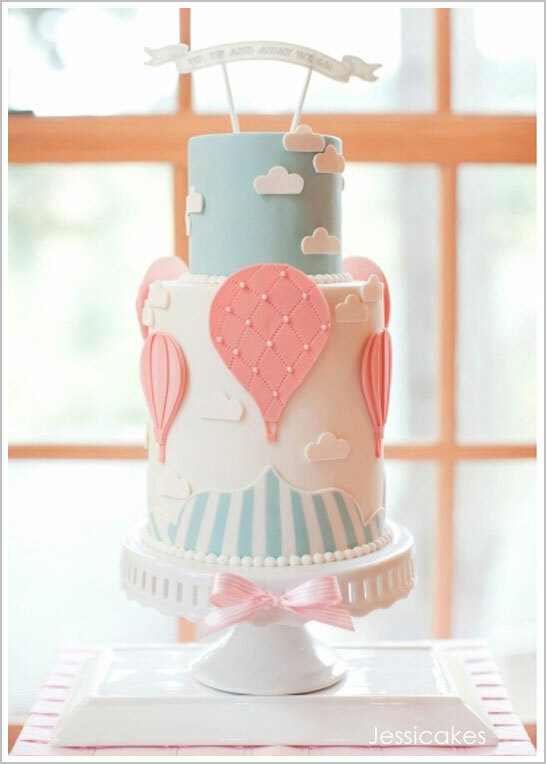 I absolutely love the striped details around the bottom and the detail work on the hot air balloons is perfect! Staggered in height and intermixed with clouds, these hot air balloons are oh-so-charming! The pink and white striped ‘tablecloth’ is actually a twin-sized sheet, found on sale at Target. Such a clever way to save money without skimping on the pretty! I could not agree more! A huge thank you to all three of these talented ladies for sharing this delightful Up, Up and Away Baby Shower with us today! It’s absolutely dreamy! 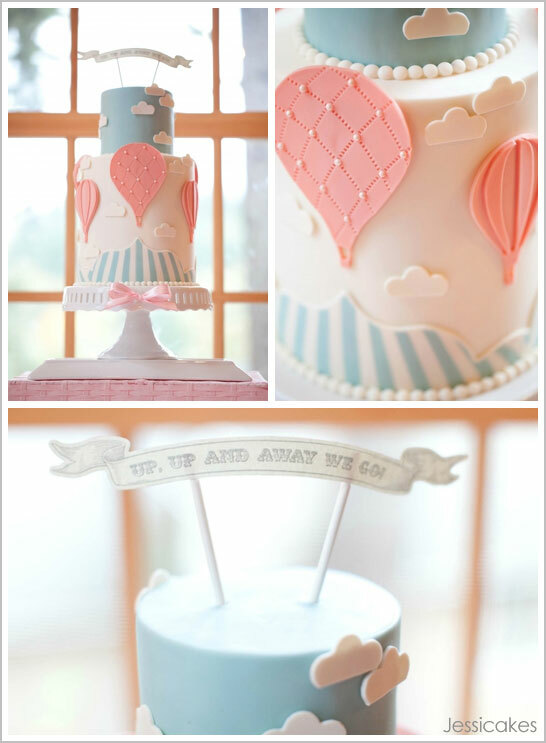 You can get the full scoop on Jessica’s hot air balloon cake on the Jessicakes Blog. I am loving this beautiful party! 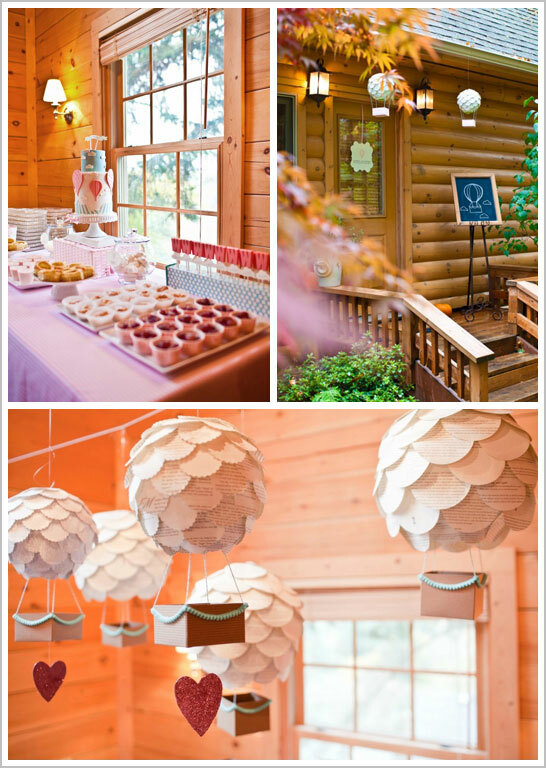 love all the pretty details…from the hot air balloon lanterns to the clouds on the straws! This is my favorite Jessicake! Makes me want to get into working with modeling chocolate. I have been a big fan of Jessicakes ever since I saw her ruffle flower tutorial. Jessica, all of your works are amazingly clean and beautiful! WOW! LOVE the post Carrie! Thanks everyone for all your sweet comments! It was such a fun cake to make! LOVE this shower! Love everything about it! Beautiful cake and so many great details!! My jaw dropped! What a beautiful cake! What a beautiful shower! Elegant and charming! I love the soft shades of color. This is such a pretty event. Hi! I found your site via Pinterst while searching for a fresh idea for my mom’s birthday on Feb. 6th. She’ll be turning 68! In the past, I’ve had surprise tea parties, surprise get togethers at restaurants, last year, a friend baked an animal print high heel shoe for her cake, The stitched in them looked REAL and the label was a take off designer Jimmy Choo. She used my mom’s name on the labe, Loretty Lou! Any suggestions on a theme I could go with quickly and inexpensively for this year? 🙂 Any input for an idea of a mature lady’s party would be greatly appreciated! Wow! This is my dream party! It looks absolutely amazing! I absolutely love the hot air balloon decorations made from pages of books. So creative! I would have LOVED to make cookies for this!!! Can I buy these invites somewhere? we keep up a correspondence more approximately your post on AOL?